Air Conditioning installation, maintenance and repair. Brant Mechanical is your service expert for air-conditioning issues. Installation and servicing of HVAC systems improve air quality and maintain the utmost comfort in your commercial space. Brant Mechanical installs, maintains and repairs roof top units including filters and fans to reduce operational costs and improve air quality. Brant Mechanical services, repairs and maintains many different chiller systems, including air-cooled and water-cooled chillers. 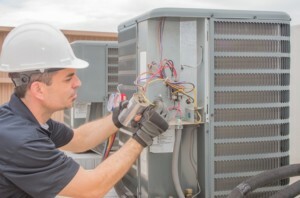 The heart of air conditioning units, the mechanical components of compressors require regular service and maintenance to efficiently operate the unit. Installation and service is available for these heat-exchange devices, very similar to evaporators, to eliminate heat from where it is not wanted. As an energy-efficient alternative, installing and maintaining a heat pump allows hot air to be absorbed from indoors creating a calm, comfortable temperature in your workplace. Maintain and monitor the status of your cooling unit and see how much energy you are using with the systems currently installed. Repair service and motor replacement is available from our trained experts for your system to run each unit smoothly. Brant Mechanical is available to help. Our trained experts will repair any leak or damage to your air duct. If the problem cannot be solved with repair, we can replace the duct for you. HAVE COOLING OR AIR-CONDITIONING QUESTIONS?